In an emotional interview with talk show host Stephen Colbert, US Vice-President Joe Biden has said he has still not decided whether he will run for president. "I'd be lying if I said that I knew I was there," Mr Biden said on Thursday. Supporters have encouraged Mr Biden to run as fellow Democrat Hillary Clinton's poll numbers have declined. However, he has questioned whether he has "emotional energy" to run after the death of his son Beau in May. "Nobody has a right, in my view, to seek that office unless they're willing to give it 110% of who they are. And I am, as I said, I'm optimistic, I'm positive about where we're going," Mr Biden told Mr Colbert. "But I find myself - you understand it - sometimes it just overwhelms you." Media captionUS Vice-President Joe Biden: "I'd be lying if I said that I knew I was there." Mr Biden, 72, failed in his bids for the White House in 1988 and 2008 before becoming Barack Obama's running mate. 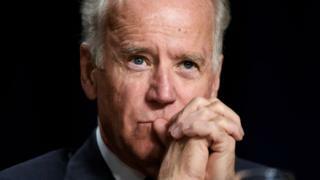 Representatives for Mr Biden said the vice-president would make a final decision by October. Some had speculated that Mr Biden would use the high-profile appearance on Mr Colbert's new show as a way to launch his campaign. Instead, the interview with Mr Colbert focused on how Mr Biden is coping with the loss of his son Beau, who died of brain cancer aged 46 at the end of May. Choking up at times, Mr Biden talked about his son and his last days. "'Dad, I know how much you love me. Promise me you're going to be all right'," Mr Biden recalled his son telling him.